Take 264 Westbound, then take the I-64 exit toward Richmond. Take Exit 282 (Northampton Blvd. Exit). Make a left onto Northampton Blvd. In 1.1 mile, make a left onto Kempsville Road. The Lake Taylor campus will be ahead on the left. Take 264 Eastbound and take the I-64 exit toward Richmond. Take Exit 282 (Northampton Blvd. Exit). Take I-64 West to Exit 282 (Northampton Blvd. Exit). Take I-64 East to Exit 281B (VA-165 S/N Military Hwy) in Norfolk. Bear right at the exit onto Military Hwy. In approximately 1 mile make a left onto Northampton Blvd. In another ½ mile turn right on to Kempsville Road. Lake Taylor will be just ahead on the right. 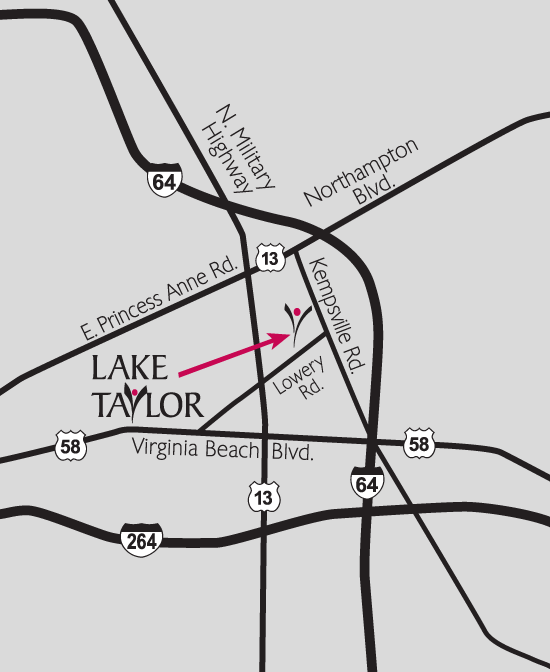 Have a Question for Lake Taylor? Simply fill out the following fields, submit the form and we’ll be happy to respond to any questions you may have.